Earlier today, I was in Redditch to meet our Redditch and Bromsgrove branch and hear about the brilliant work they’ve been doing – especially on reducing the stigma of mental health issues. It was great to meet staff who have benefitted from the branch’s work, as well as some of the team who have provided help at the branch, which covers Redditch Borough Council and Bromsgrove District Council. I took part in one of their quarterly “Time To Talk” sessions where UNISON members can enjoy relaxation techniques, discuss health concerns with a pharmacist and talk about their finances. Over the four years the scheme has been in place, it has helped dozens of staff, leading to a drop in sickness rates and a general increase in acceptance of issues which are often difficult to confront. One example of this incredible work is Wayne, whose story brought me to tears. He has faced real struggles in his life – from abuse in a children’s home, to drug use and years of depression – that most of us could never truly understand. Wayne said that UNISON “rescued” him through the Time to Talk project, and that before his life was just about “suppression and surviving”. He told me that thanks to the branch, he’s now living his life, rather than just surviving, all because he opened up and talked. For the first time in his life, he said, he’s now moving forwards. 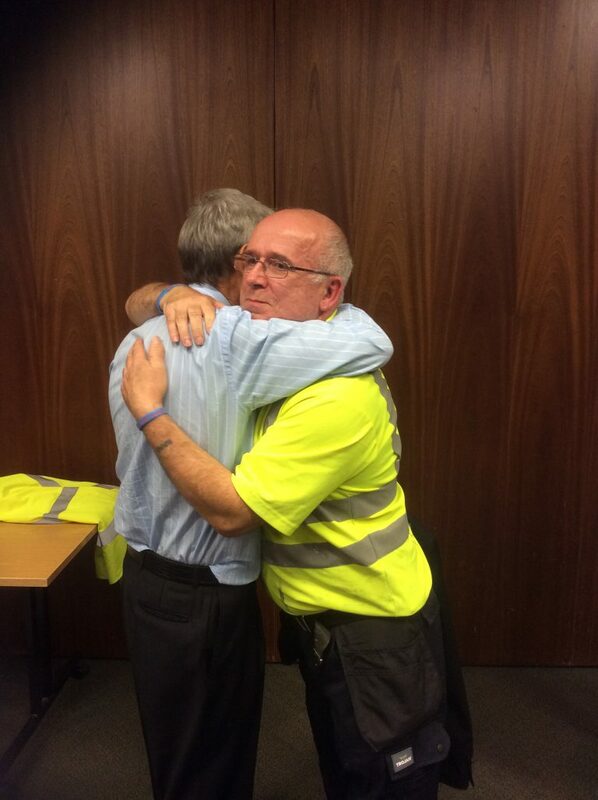 Wayne’s story – and the dozens of other members who have been helped – is a testament to the great work done by branch secretary Laney Walsh and her team. They were worthy winners of a regional UNISON health and safety award for their mental health work in 2014, and are an example of what our union at its best can achieve for members in the workplace. I will never forget my visit here today, the dedication of the branch, and the impact their work has on people like Wayne. Days like today make me so proud to be UNISON, and of everything our activists and members do to make each other’s lives better, alongside helping our communities every single day. It’s time to talk for a change. Being safe and healthy in our workplaces might seem like an obvious thing to expect – but that isn’t always the case. All too often work can be dangerous, unsafe and cause lasting health problems. That’s why it’s so important that this week – European Health and Safety Week – we focus on making work healthy and safe for everyone, especially with many of us working for longer as our population ages – thanks to increased life expectancy, no default retirement age, raising state pension age, plus poor pension provision. UNISON has a proud record of supporting health and safety reps in the workplace, and building positive relationships on these issues with employers – that’s why we’re handing out “High 5’s” to branches who are doing great work promoting health and safety in the workplace. Inspect the workplace – or assist a new safety rep to do so – using our inspection materials. Survey your workers and members to identify concerns. Together we can make our workplaces safer for everyone – and this week is a great time to do it.